Today we find many Christians who look to the law for motivation to good works. This is a complete misunderstanding on what the law does. Mainly it is due to the lack of firm execution of the law in sermons. This was pointed out recently by Pastor Tom Baker of the Law Gospel broadcast. In a recent television commercial a local Baptist Minister was inviting people to tune into the worship broadcast for practical insights for living to aid them. This is an historically conservative fellowship similar to the one in which I was raised. Years ago from the pulpit one would hear how miserably we are doing when compared to the Holy requirements of God. There were no pointers on improvement. No invitation to look to Jesus to help you with stress. The law was laid down with all its crushing force. Only then was the sweetness of Jesus’ finished work on Calvary was proclaimed. Jesus was not held out as an example we can follow. He was not presented as a cheerleader giving us a rah rah in our daily race. Due only to the finished work of Jesus we have full confidence toward God. He is not sitting up there shaking His head back and forth at our failures to keep His commands. He determined long ago we were unable to do this. No when God looks upon those in Jesus He is well pleased with the fruit of the Holy Spirit that we do. These are activities that He has called us to do in our daily rounds. The faith that we have which receives His gifts of forgiveness of sins and trusting in His promises is well pleasing to Him as well. Why are these fruit and faith so pleasing to God? For they are His doing and nothing from us contributes to them. We are passive receivers. That is what is so tragic with sermons such as this minister was promoting. It is causing people to either become secure or terrified sinners. Christ and Him crucified is to be the main thing in all sermons not a seminar for successful living. People need to be killed with the law and given life in the Gospel. This does not draw large crowds any longer. However, it does keep people from going to eternal death because of His promises of the gift of life through hearing the words of Christ. Recently a young friend of mine asked me what I think motivates someone to believe. Much of what passes for preaching these days is encouragement to stop not believing and trust in Jesus and everything will be better. Tell that to the early church many members of which suffered severe persecutions many of them were killed for no other reason then the testimony of Jesus. To this day in many parts of our world brothers and sisters are robbed of livelihood, beaten, outcast and killed for the same reason. No the idea that one can come to faith under the sweet talk of a so called preacher is nothing but the Theology of Self Glory. This strokes our flesh by telling us we can do something to change our relationship with God. Just by making a decision to accept Jesus is all it takes in these fevered imaginations. They will say that making a decision is not a work. Don’t believe that for a minute. Many executives get paid massive amounts of money for decisions. The passage above is commonly referred to as the Parable of the Lost Sheep. Rev. Tom Baker of the Law and Gospel broadcast says it is misnamed. The name of it should be rather Parable of the Rejoicing Shepherd. This title places the emphasis where it belongs on Jesus the Good Shepherd. Jesus is the one who motivates one to the Christian faith. He seeks out the lost, breathes life into her and carries her back to His fold. What is placed upon His shoulders is the curse of the law which He carries up Calvary and pays the penalty with His own precious blood. Once the person is given new life she will see Jesus as a loving God not the ogre which used to scare her. That god is the devil masquerading as God in order to keep people in enmity with Him. This is part and parcel as to the reason one cannot claim any credit for coming to God. Prior to the gift of faith one had a caricature of God not the real Creator. Yes many people are scared of God and with good reason. Each and every person knows there is a problem between them and God. But they think it is God’s problem and they must find ways to get on His good side. Some have committed suicide by drinking poisoned Kool-Aid and others have flow jets into buildings in order to placate this angry Creator. Given the viewpoint the unbeliever has of God who can blame them for trying to become atheist. No. We have a kind and loving Shepherd who gave His life for each and everyone of us. He gives us the faith by which to receive His gifts of Baptism, eternal life, preaching of the word of forgiveness, and the Lord’s Supper for the forgiveness of sins and strengthening of our faith. What does He ask in return? Not a thing. Out of love and gratitude we want to do things for our neighbors that will please Him. But those acts of charity do not add anything to our salvation for it is finished. Those are great promises of comfort. God has it all planned out for us that all things work together for our good and we are conformed to the image of Jesus. Romans 8 is a wonderful thing to behold. Some have understood that to be conformed to the image of Jesus to be able to be well respected, honored, appreciated etc. Pretty heady stuff to appear to be like God the Son isn’t it? Those are not things that one who seeks to walk close to the Crucified One will necessarily have. Throughout history those who believed in Jesus from the early older testament time prophets, our Lord Himself, the Apostles, many early church fathers and many Christians down to our present age are conformed to the image of Jesus through persecution and martyrdom. This world is not on the same operating system, if you will, with which God created it. In this world the Creator became man was rejected, persecuted and killed rather than greeted with open arms. As followers of Jesus we can expect the same thing. In this world we have the unholy trinity of the world, flesh and the devil with which to deal. Jesus said the world hated Him and will also hate us who follow Him. We are not greater than He are we? So it will come as no surprise when we endeavor undertakings that we meet with resistance. Just take the message of Jesus out in the world and see the rejection and loss of relationships that will happen. This is to be expected by those who wish to walk with Jesus each and everyday. We are also in constant struggle with our own sinful flesh that will never do the right thing and rebel against holy living. Add to that dealing with those around us unbelievers, false and erring brethren one can end up quite alone and feel rejected. Jesus had that happen where even His close disciples took a powder and abandoned Him on the night of His betrayal. A servant is not greater than his Master. And our adversary is prowling about like a lion wanting to devour us. He will personally and through others blame you for all the problems in this life. His aim is that you at the least stop growing in the Lord but his ultimate purposes are for you to lose your faith. Jesus said some would believe and due to temptation and persecution reject the faith. A pastor one time said that when a baby is baptized he or she has a target painted on his or her forehead that the devil will see and go to work on them. The same with an adult convert. In baptism we have the Name of our Father, Son and Holy Spirit placed on us and we see Satan is always working at counter purpose from his creator. Yes he indeed hates all of humanity but especially those redeemed by God. Rather bleak isn’t it? But on the other hand we have the Holy Trinity on our side. We are in the image of Jesus in being perfectly holy in the sight of God. Even though our best works are in themselves sinful God looks upon those in Jesus and is quite pleased. What a wonderful peace to know that in spite of how things are going here is that we have a loving Father Who will neither reject us nor let anything grab us out of His hand. Jesus gives us these crosses we do not choose them. This is special suffering we have only due to the fact of being a child of God. While cross bearing in this life we also know that someday we will be raised to new life to the fullness. 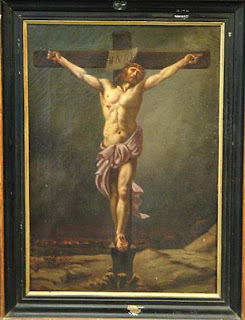 At that time we will see Jesus for we will be like Him united forever with the Holy Trinity in eternal love and bliss.